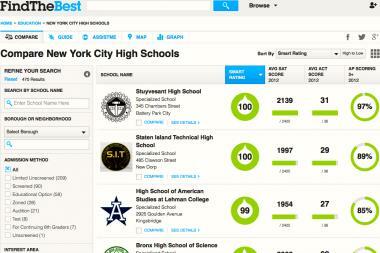 FindTheBest is one of six new apps to help New York City families sort through the high school admissions process. MANHATTAN — Sleek apps designed to help students and parents find their way through the high school admissions process went live Wednesday. The tools provide an alternative to sorting through the Department of Education's 565-page admissions guidebook. Users can now simply — and quickly — click on information for everything from a school's SAT scores and college enrollment rates to transportation and school environment. "It's just a very complex and confusing process," Deputy Chancellor David Weiner said of high school applications. "We're not trying to make the decision for parents, but we're trying to make the information more easily accessible." The six app developers, FindtheBest, InsideSchools, Noodle, Unigo, Admitted.ly and Vital.AI — many of which also create apps for college admissions — were awarded $12,000 each as part of the DOE's School Choice Design Challenge, which is funded through a federal Investing in Innovation grant. They designed their apps using data based on feedback sessions with students, parents and guidance counselors. As expected, families wanted to see results on college admissions and exams, but Weiner was surprised to hear that they wanted to see information beyond school walls including, for example, safety issues in the surrounding communities. The apps will let families create customized searches based on their children's needs. For instance, Noodle will let them find which schools have specialized dance courses or environmental science programs or robotics clubs. FindTheBest — which students picked as the winner of the challenge at a DOE event in Gramercy on Tuesday night — has an "assist me" tool to find matches based on what families find most important, such as the average high school graduation rate or the type of school. By matching schools to a students' particular needs, Weiner hopes it will help direct families to some "under-the-radar" schools. "We hope this broadens schools parents look at," he said. It will also help gadget-loving students, developers hope. "This is designed to make life easier for today's tech-savvy 8th graders," Insideschools founder Clara Hemphill said in a statement about her group's app. Each company has committed to maintaining its application and adding new data for at least 18 months, school officials said. High school applications are due Dec. 2. Students can submit applications for up to 12 programs.